Try to think out of the box! Great choice Samantha! Brief Synopsis – Two co-workers at a gift store in Europe can’t stand each other, and don’t realize that they are secretly corresponding with one another through the mail. This movie was Samantha’s choice for me to watch. The concept of this film is one that I was quite familiar with since I’m a big fan of the 1999 remake with Tom Hanks and Meg Ryan – You’ve Got Mail (1999). The way things are presented here was probably much better when seen through the eyes of someone in 1940 than it can be now because it doesn’t flow as smoothly as a story like this one should. 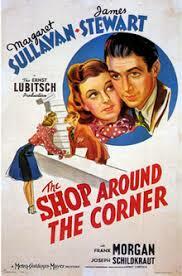 THe cast is quite good and Jimmy Stewart and Margaret Sullavan have very nice chemistry together. This is more difficult than one might think since there characters are meant to hate one another when meeting in person, yet when writing to one another they are completely different people. The story itself begins quite well, but over the course of the movie, they lose much of the credibility established at the beginning because of the way that they choose to present certain aspects of the storyline which doesn’t work as well as one might hope. This is one of the rare cases when a movie’s remake is much better than the original because they manage to keep thing much more interesting even though the concept is virtually identical. Bottom Line – Great concept for a romance film that probably worked much better when it came out than it does now. The cats is quite good and Stewart and Sullavan have nice chemistry together despite the fact that they are meant to hate one another when they are shown together. The story itself starts off really well, but loses a lot of its credibiloty along the way due to the choices of how to present certain aspects of the storyline. This is a rare exampe of a film that was remade and the remake is actually much more enjoyable. REcommended! Genre Grandeur Worthy? – Come close, but the story loses most of its credibility along the way due to the choices on how to present things. The remake with Hanks and Ryan is so much more enjoyable.